What are the benefits of a Salt Cave? Why use Halotherapy? There are no side effects, it uses high quality salts, and it’s very effective. Dry salt therapy is a natural and holistic treatment for adults and children that has been known to aid in detoxifying the respiratory system, healing skin conditions, promoting better breathing, increasing sounder sleep, and achieving overall wellness. It reproduces the microclimate naturally found in salt caves by dispensing high concentrations of dry salt aerosol into a room. Salt aerosol inhalation and the use of saline solutions are not new or foreign ideas – doctors have been using saline in mainstream medicine for a long time to help relieve respiratory conditions, sinusitis problems, and allergy symptoms. “Inhalation of hypertonic saline produces a sustained acceleration of mucus clearance and improved lung function. This treatment may protect the lungs from insults that reduce mucus clearance and produce lung disease,” according to the clinical studies published in The New England Journal of Medicine, 2006:354:241-50. 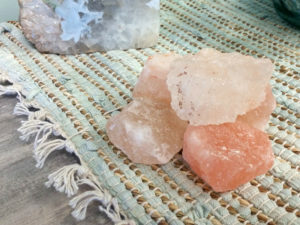 Himalayan salt rooms are as tranquil as they are therapeutic. During your 45-minute session, the soothing atmosphere will envelop you, while the salty air will administer its natural healing with each deep cleansing breath. Salt is naturally anti-inflammatory, antibacterial, antiviral, and anti-fungal and has been used for thousands of years therapeutically. Halotherapy treatments help to treat all four major factors that cause respiratory symptoms: inflammation, bacterial infections, excessive mucus, spasm (bronchospasm), and hyperactivity. In most patients, after the course of Halotherapy, the clinical condition improves and symptoms disappear or significantly ease. As a drug-free treatment for asthma, bronchitis, cystic fibrosis, sinusitis, etc. See what our Salt Room can do for you. Elkins M.R., Robinson M., Rose B.R., Harbour C., Mariarty C.P., Marks G.B., Belousova E.G., Xuan W., Bye P.T.P., the National Hypertonic Saline in Cystic Fibrosis (NHSCF) Study Group. “A Controlled Trial of Long-Term Inhaled Hypertonic Saline in Patients with Cystic Fibrosis.” The New England Journal of Medicine 2006; 354:229-240, Jan 19, 2006. Donaldson S.H., Bennet W.D., Zeman K.L., Knowles M.R., Tarran R., Boucher R.C. “Mucus Clearance and Lung Function in Cystic Fibrosis with Hypertonic Saline.” The New England Journal of Medicine 2006; 354:241-250, Jan 19, 2006. Everyone in the office is so wonderful! They are very nice. Mary and Marsha answered all of my questions and were so understanding that it was my first time. They really made me more comfortable. I’ll be back for sure. Halotherapy of St. John, Indiana is located in Northwest Indiana. Currently, there are just a few active salt caves operating in the United States. They are more common in Europe and Canada in part because insurance companies in those nations cover the treatment. Visit us today to feel the benefits. Get healthy, get relaxed, and enjoy the experience.